So far I have swum on Christmas Eve, Christmas Day, Boxing Day, and now today (the 27th)...so I reckon I'm well placed to aim for the Twelve Swims of Christmas. So far all the dips have been freshwater and, ahem, very fresh, at around 7 degrees...but today we went to Westcombe Beach, where the sea was a much more forgiving 11 degrees. 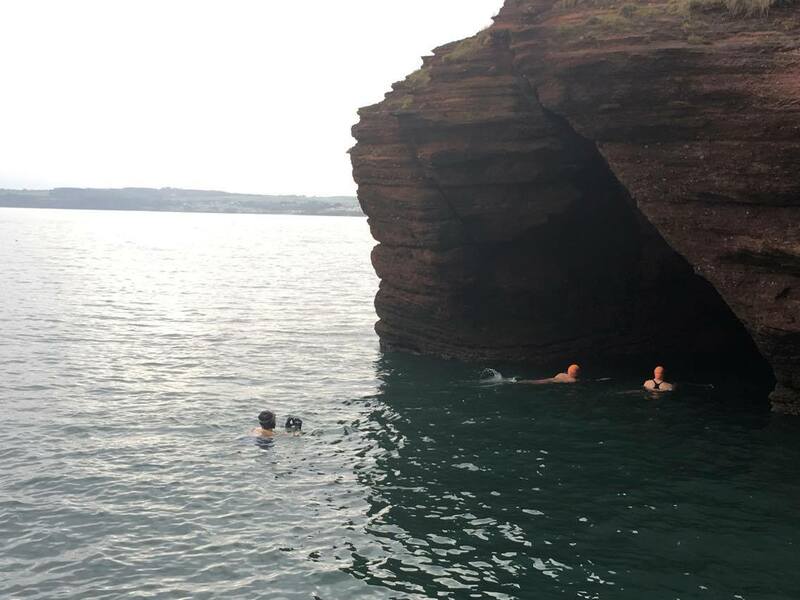 It's one of my favourite coves, with pink and grey striped rocks in all sorts of sinuous shapes, and all manner of caves and rock pools. It's a wonderful place to wander around and explore, especially at low tide, and you lose yourself in a weird world of rock. After a good explore I then had a swim, saying hello to a seagull which was bobbing about nearby, and looking over to Burgh Island in the distance. Pix by Alex Murdin. I never tire of swimming at the Hindu Temples in Torquay. 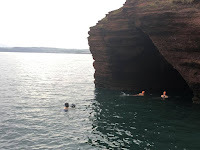 They are a set of interlinking caves in the sandstone cliffs at Livermead; the writer Charles Kingsley described them thus: "the fantastic rocks of Livermead, scooped by the waves into a labyrinth of double and triple caves, like Hindu Temples..." They are an extraordinary natural feature. On Saturday morning we arrived to find the sea calm and a stunning petrol blue. The dark entrances of the caves beckoned us in and rock doves cooed above, roosting in the crevices, as we swam into the gurgling depths of the first cave. The water swirled around in the second cave and I got a bruised knee, but I never mind a few bruises after a swim like that.